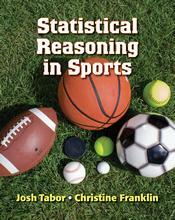 View a recording of co-author Josh Tabor to learn more about Statistical Reasoning in Sports (SRiS). Offering a unique and powerful way to introduce the principles of statistical reasoning, Statistical Reasoning in Sports features engaging examples and a student-friendly approach. Starting from the very first chapter, students are able to ask questions, collect and analyze data, and draw conclusions using randomization tests. Is it harder to shoot free throws with distractions? We explore this question by designing an experiment, collecting the data, and using a hands-on simulation to analyze results. Completely covering the Common Core Standards for Probability and Statistics, Statistical Reasoning in Sports is an accessible and fun way to learn about statistics!